Your home's complete digital piano entertainment center in a rich, black finish. Good looks and hi-tech don't always go hand in hand but the newest addition to the Suzuki family of Micro, Mini and Baby Grand Digital Pianos is an amazing combination of performance features and stunning appearance. The MDG-300 is perfectly portioned and will add both warmth and charm to your personal environment. Measuring only 2'-4" deep, it comfortably fits any room size or decor. Technically speaking, the MDG-300 has enhanced performance features not found on almost any other Digital Grand Piano in its price range. A full complement of hi-tech features allow for endless musical possibilities. Sporting bluetooth compatibility, you can access music, lessons and demonstrations from the internet any way you choose. A true full color LCD control screen makes it easier to organize your selected features. Only the most advanced synthesizers boast 128 note polyphony for incredible full bodied sound. The MDG-300 includes this advanced feature. The piano voice is an amazing 24Mb of powerful sound reproduction played through a 6 way stereo sound system. Create your own original compositions with the on-board 3 track music sequencer. Save and store to the Secure Digital(SD) Memory Card. The MDG-300 is a complete entertainment center. It blends perfectly into todays modern living space and lifestyle. Whether you are just starting out or an accomplished musician, the MDG-300 is ready to perform for you. The MDG-300 features a powerful 6 speaker sound delivery system. High grade speakers and integrated tuned cabinet deliver a truly dynamic sound, rich with presence and power. As a tech titan, the MDG-300 includes the latest Bluetooth technology. Wireless networking enables any wireless device to connect to your MDG-300 Digital Grand Piano for expanded and convenient operation. Connect the MDG-300 to your iPad and convert it into a recording studio! Makes practice and playing time a lot more fun. If you have kids, it might make all the difference in encouraging them to practice! The MDG-300 has a USB port that opens a world of exciting add-ons and extra functionality. Plug and Play directly with your laptop or desktop computers. Or you can use the MIDI ports to transmit and receive data from other musical instruments or computer accessories. The MDG-300 has a large 4.3 inch LCD display screen in full color to help organize your selected features. Find what you need quickly and easily with this large window format. An amazing combination of 128 voices, 100 rhythm styles and recording features create endless musical possibilities. Professional styles make you a member of the world class band of your choice. Rock to Bach, World Beat to Jazz ensembles, Boogie Woogie to New Age, your musical spectrum is limitless. The MDG-300 has a velocity sensitive, graded hammer action keyboard that offers superb response and smooth feel. Also available in Cobalt Blue, Red, and Brown finishes. 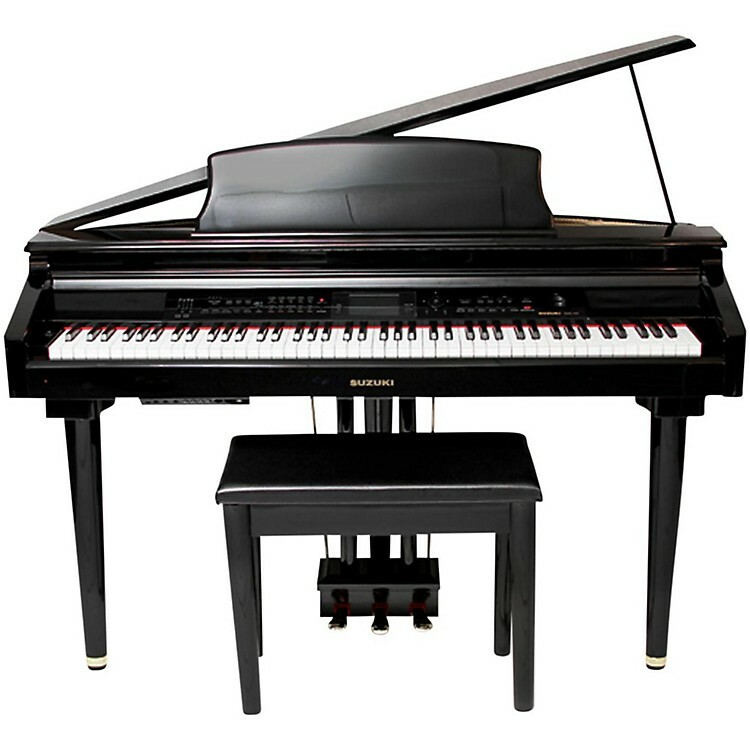 The perfect fit for any room, order this micro grand today!